Yes, that title is a horrific paraphrase of the start of an old joke. 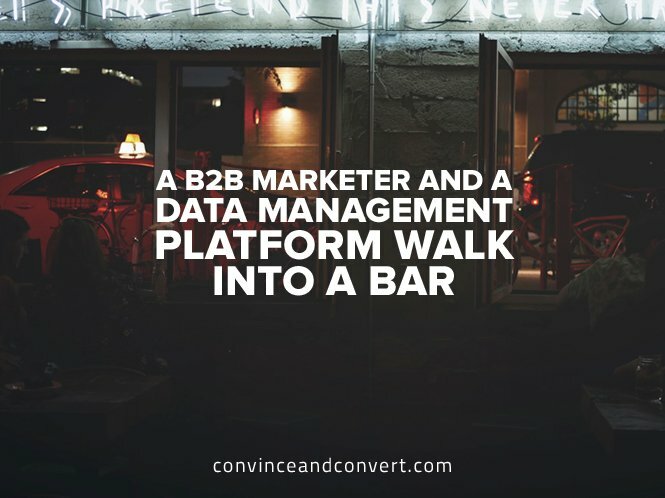 But it’s no laughing matter when it comes to the need for B2B marketers to take full advantage of a data management platform, also known as a DMP. Perhaps it’s something I ate, but I am definitely on a DMP kick lately, having just espoused why CMOs need to embrace DMPs. This time around, it’s you—the business-to-business marketers of the world. B2B marketers are faced with the difficult task of disseminating data from several systems, both online and offline, internal and external. Moreover, they are grappling with the fact that the always-connected buyer’s behavior and preferences are constantly evolving. This puts the onus squarely on the marketer to maximize the value of customer data in near-real time for better targeting and personalization, as well as to build lifetime value. Marketers, most importantly, want to be certain that any pre-qualification or lead information they have is accurate and up to date so that they consistently deliver the best value possible within any given sales cycle. By doing so, marketers are empowered to contextualize the challenges and offer the best solutions to their customers and prospects out of the gate. Why Are DMPs Growing in Popularity? Centralized control and standardization of existing first-party data. Using the data they already have for better email, web, social, and content personalization. Developing rich and actionable datasets across first-, second-, and third-party data sources. B2B marketers face unique challenges in that not only do they have their data in several different siloes (such as sales, marketing, and customer service), but they also need to keep up with non-traditional data sources and proliferating campaign scenarios, not to mention legacy CRM data that may not have been “activated” in a while. To add to this challenge, within many B2B-focused companies, it is common to find multiple technology platforms for supporting different functions, such as content marketing, web and mobile analytics, social marketing, CRM, and marketing automation platforms. B2B organizations stand to benefit greatly from a DMP platform, given that it performs all of the above functions by centralizing customer data on a single platform and enables better media buying decisions, as well as overall customer experience based on richer audience understanding. Use audience data to inform lead qualification processes. Convert raw mobile data into measurable insights for effective marketing attribution. Use the data you already have for optimized customer marketing and customer profile insights. Extend the reach of successful marketing through advertising and using look-alike modeling to fill acquisition needs. For too long, B2B marketers have been bogged down with data siloes that have led to inconsistent and ineffective customer and prospect outreach. With the right DMP in place, B2B marketers don’t need to suffer any longer.